In a few weeks time, I will be flying off on a trip to Indonesia and that’s when I found myself scouring the Internet for some last minute travel tips. After reading up for a couple of days, here are a few tips that I thought were pretty ingenious. Hopefully, you guys will find this as useful as I did! Enough said, let’s buckle up and get ready for take off! Males and females alike, this is a tip that many travellers swear by. Coupled with this, be sure to arm yourself with a couple of sentences and phrases that you can use in their native language and you girl, are setting yourself up for a darn good trip! As much as you can, try to blend in with your dressing and this may give you a completely different experience as the locals are more likely to open up to you! Besides, standing out like a sore thumb also makes you a target for scams and pickpockets! A personal tip is to do some research beforehand by making use of social media (yeap, that thing that is seemingly taking over the world). Me whenever I’m in need of some wet wipes unfortunately, ran out of them. This is one item that I absolutely swear by whenever I travel! My mom and I tend to go crazy and bring a large supply of it and thankfully, we’ve never ran out. Ever. The thing is, wet wipes are such a good item to have with you for they may become your life saviour when you least expect them to! The possible scenarios are simply endless. For adventure junkies, this is an absolute must for any impromptu excursions that may leave you dirty and sticky. For those taking a long haul flight, this would help keep you clean and refreshed even after you touch down at your destination. For foodies, even the most assuming act of eating an ice cream cone may eventually call of it when it starts melting! As a typical kiasu Singaporean, I am one of those girls who’ll pack a period kit whether or not I am expecting Aunt Flo to pay a visit during my trip. 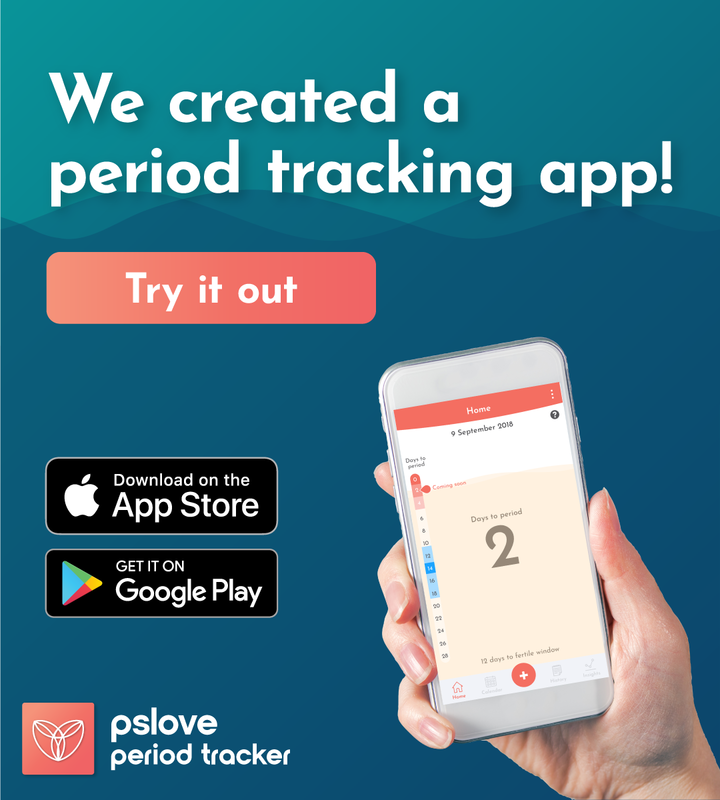 Travelling is known to throw your period cycle off charts and that’s why I always prefer to have one of these for emergencies. Especially if you’re uncomfortable with trying out new brands, be sure to stock up on your own supply! I also like to keep a couple of these with me wherever I go just in case I am unable to get my hands on one when I need ’em. Snacks such as raw or unsalted nuts, snack bars, dark chocolate and trail mix would fit the bill. I don’t know about you guys, but I tend to get cranky when I’m starving. This is also when my cravings for salty and fried food hits, hard. While you may be tempted to consume them, it is important to eat well while travelling! Instead of those complementary ice cream tubs that you may have been eyeing since service started, have some of these snacks instead! 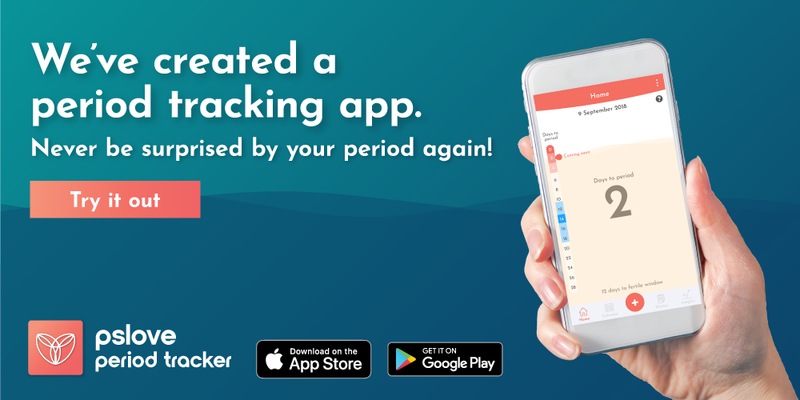 A life saviour for those of you who experience period cramps. 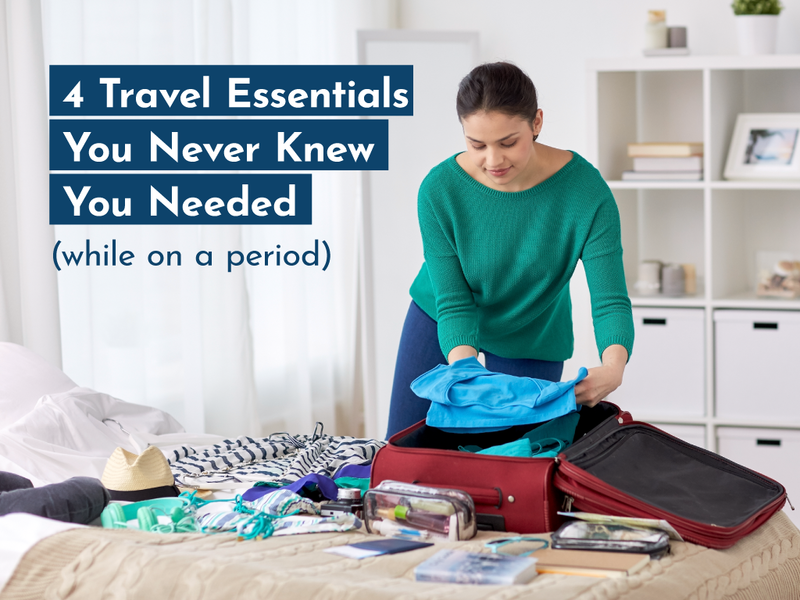 Although exercising works, this may not be possible when you’re on a long haul flights so be sure to pack one of these to stay comfortable while travelling. 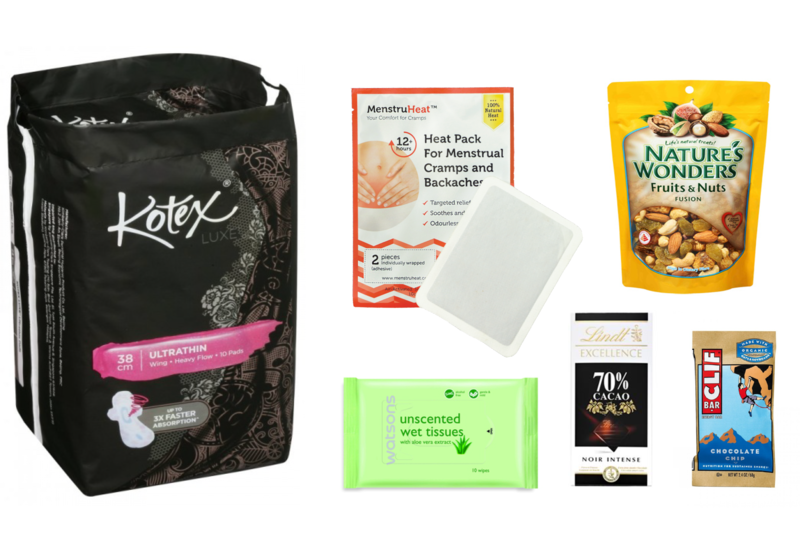 Check out our MenstruHeat packs! I’m sure many of you would have experienced the horrible effects of jet lag, one that turns you into a zombie overnight – sleeping during the day and roaming the streets at night. Granted, that’s a bit of an over-exaggeration but you folks get the gist of it aye? It is almost impossible to enjoy your trip when you’re feeling energetic and sleepy at all the wrong timings. Well, here’s a tip for you! Set your phone or watches (whichever that you’ll be referring to on your flight) to the time of your destination before you hop on the plane! I’ve found that this is especially useful in helping me to regulate my sleep and meals whenever I’m on a long haul flight. If it is supposedly morning at the place where I’m heading towards, I would typically try to resist the urge to sleep and vice versa, if it is night time, I’d try to grab some winks. Similarly for meals, I tend to start shifting my meal times slowly in accordance, avoiding heavy meals when it is night time at my holiday destination. And.. moving on to my last tip. Okay, hold up guys, I know that heading up there can be pretty confusing but stay with me on this. Personally, this is something that I try to do whenever I’m travelling and that is to say yes as much as possible within my own limits. Being a creature of habit, I can safely say that I absolutely detest having to step out of my comfort zone. However, on every trip I take, I make it a point to try at least 3 new things, be it a new food dish, a new sport or a new way of exploring the city. Saying yes have allowed me to experience each country in a slightly different way and truth be told, I’ve never regretted saying yes in those situations. Travelling is very much an opportunity for me to explore and experience things that I never would have done back at home. I love how it allows me to see the world in a fresh perspective, so why say no, when you can say yes to what the world has to offer? Take the road less travelled and you may find yourself a gem that you never would have should you have stayed on the main route. That said, whatever it is you do, always trust you gut instinct. Do not put yourself in an uncomfortable and vulnerable situations, especially for solo travellers, and make sure to have a plan B in mind in events when things go awry! So, say no when you sense that something is wrong or when the situation seems a little iffy.